Let us do some more basics with the “Spring Rich Client” 1.0.0 (SpringRC). Although it is time to give an overview of the entire architecture I won’t do this here, because I am a newbie with Spring and SpringRC. So we will just look into the steps how we get things running. And insert <property name=”settings” ref=”xmlInternalSettings” /> into the lifecycleAdvisor bean’s property list. 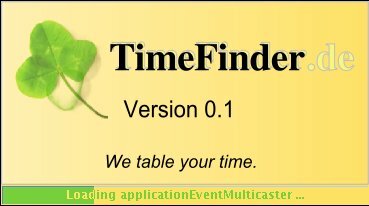 setup.intro.description = TimeFinder in one of its future releases will help you with automatic and manual timetabling. setup.cancel.message = Do you really want to exit the application? The most of the xml code above is necessary to inject a new instance of Settings which will be created from the SettingsManager. Does anybody of you know, how I can do this in Java, not in ugly xml? Well, I could create the factory directly in the LifecycleAdvisor, but how can I do this dependency injection in Java (with Spring)? 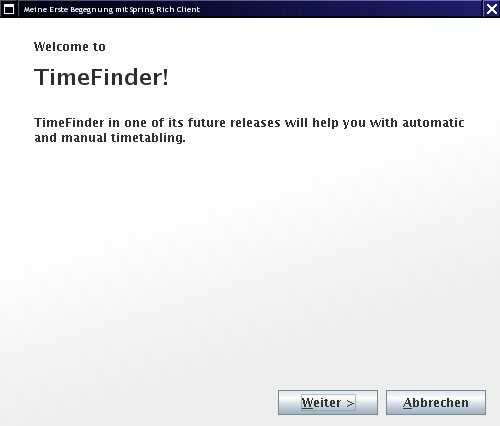 This settings object is then accessible within the LifecycleAdvisor because of the setSettings method and is necessary to save, if this wizard should be prompted on the next startup again. The xml-settings will be written to currentPath/settings/internal.settings.xml. Hopefully I can create a next blog entry about the docking framework MyDoggy and the integration into SpringRC. Now it works like a charm - try it out! (see resources). Today I will show what you can apply to all ‘component managers’ that are integrated in SpringRC. First: there is one application per virtual machine. But there could be one or more ApplicationPages (JFrames) with several views (center, north, south, …). In our case (MyDoggy) there is only one ApplicationPage. 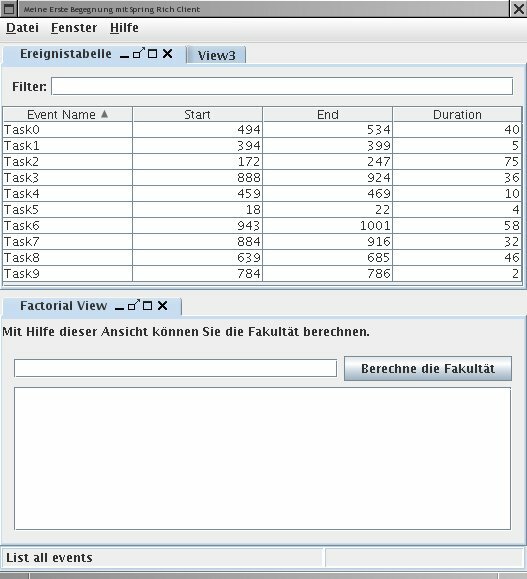 One thing you have to know is: How to translate keys within this ‘external’ CalculatorView? //protected Object construct() in SpringRC's SwingWorker! //sw.clear(); // reuse would be possible with SpringRC's SwingWorker! The most important point for me is that SpringRC is ‘only’ a sweat jar collection and not a layer between me and Swing. 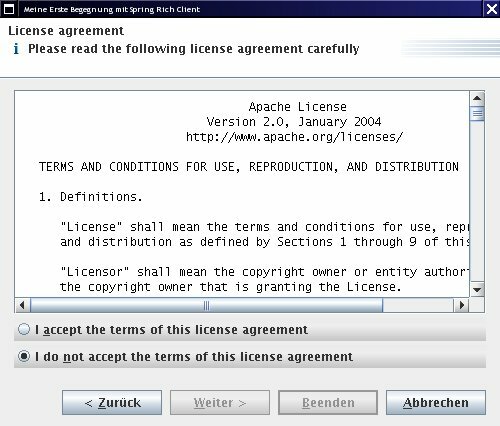 Another point is that SpringRC uses dependency injection and NetBeans RCP uses the service locator approach e.g. instead of the setter injection in the very first example for SpringRC. Another older, but very good tutorial is located here. Maybe it is interesting to know: in the updated version of the book Spring - A Developer’s Notebook the last chapter 9 is about the Spring Rich Client Project (author was Keith Donald). Here you can download the project without the jars included in the SpringRC’s download (It is a NetBeans 6.1 project, so you can simply copy all jars of SpringRC into the lib folder and open the project with NetBeans. Then resolve references via right click or change the references directly; in nbproject/project.properties).